There are links over the on the right hand side this site’s homepage with more details. Today we released a remixed, remastered, expanded version of my first album, Spinning the Compass. I think it sounds rather good. You can get the whole thing (or just the new tracks if you want) at this link. Spinning the Compass is my first solo album. Originally released in early 2010, here it is remastered and in places remixed. I had not planned on going solo in 2009 when I started working on these songs. I was still doing silly things with Comrade Robot, and at the time that was my main musical undertaking. 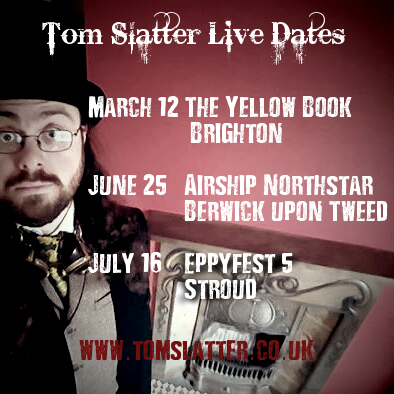 But as part of February Album Writing Month 2009 I had written a few songs that seemed to fit into a steampunk theme, so on and off over that year I put things together. It just so happened that independently at the same time, my brother Joe was also working on steampunk projects, particularly his ‘Oldroid’ models, so there was a ready made set of photos and ideas to use as artwork. Spinning the Compass is about body horror, bad dreams and machines that get in the way or substitute for real love. Mechanism talks about love gone wrong, I Still Smile about latex and rubber alternatives to human contact, the title track is about being lost in a contracting world that doesn’t make sense and threatens to disappear. Nevertheless, it is to me a happy album. It was recorded cheap mics and even cheaper software, and I didn’t really know what I was doing. It received my first bad review in which it was referred to as ‘an experiment too far’ (and a few good reviews too) and I learnt a hell of a lot from making it. It is also where the Seven Bells John saga started. The Steam engine Murders and the Trail of Seven Bells John, from my fourth album, was written at the same time as Spinning the Compass. Lines Overheard at a Séance is most definitely part of that narrative. Indeed if you’ve heard my most recent EP, Black Water you will have heard the musical echoes of this in ‘Ghosts in my Dreams’. This version of the album also includes two new tracks ‘The Man Who Learned To Fly’ and ‘Lines in the Dirt’ both of which I wrote at the time but didn’t have time to finish recording before I finally got bored and released the album. This accidental album kicked off a solo ‘career’ that so far has encompassed 4 albums albums, a few EPs and lots of fun.